From his debut at Yankee Stadium in 1936 until his death in 1999, Joe DiMaggio made Americans feel good. "People used to pile around him like he was God Almighty. And everybody loved him and it was Joe DiMaggio and that was it," says Spec Shea, a former pitcher for the New York Yankees. 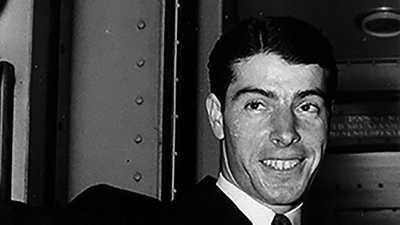 At his prime, the elegante DiMaggio thrilled the nation with an unprecedented 56-game hitting streak and a starlet wife. But there was a dark side to life in the limelight: in the middle of it all, Joe was tightly wound, ulcerated, coffee-jangled, sleepless, and lonely. He had millions of fans, thousands of acquaintances, hundreds of pals — and not one friend in whom he could confide. 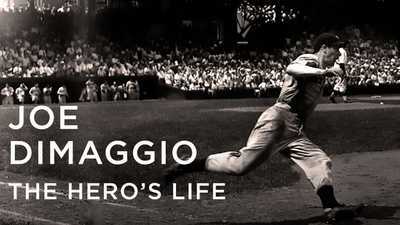 "Joe DiMaggio: The Hero’s Life" is produced by Mark Zwonitzer and written by Richard Ben Cramer and Mark Zwonitzer. 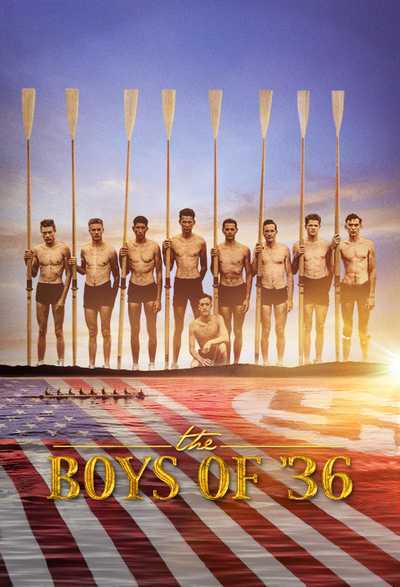 Through the voices of childhood chums, Army pals, teammates and others, the ninety-minute special presents an unconventional, sharp-edged portrait of a man who lived a life of public triumph and private pain. Richard Ben Cramer narrates. 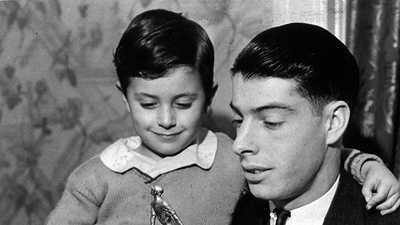 One of nine children, DiMaggio was raised in an immigrant Italian community in San Francisco’s North Beach. When Joe bombed out of school at age fifteen, no one even noticed. It was baseball that saved him from becoming a bait fisherman like his father. Joe started with the neighborhood team, but a few months later was lured away by a rival team for two dollars. Soon he was a hitter-for-hire on semi-pro teams around the city. "He could throw, he could field, he could do anything," says Frank Venezia, boyhood friend. "And I think deep down he knew he had it. But he never bragged. He never talked about it." He got a tryout with the San Francisco Seals and soon his name was bannered across the same newspapers he had been selling just the year before. In his rookie season, he got hits in 61 straight games. By the time his streak ended, Seals Stadium was aswarm with major league scouts. Two days before his twentieth birthday, he was bought by the New York Yankees. Dozens of sportswriters awaited Joe’s arrival at spring training in St. Petersburg, Florida. Now the hero machine swung into action. Radio, newsreels, and glossy magazines brought the shy and silent Sicilian kid into millions of lives. "Joe was the first one we knew like a friend," says narrator Richard Ben Cramer. "He was in our lives — his stance, his smile, the woes of his famous and fragile body, the quaver of his voice." For the first time since Babe Ruth’s retirement, the Yankees drew a million fans. "When it comes to personal magnetism, you’ve either got it or you ain’t," wrote Lou Miley in the Daily News. "Gehrig is a helluva ballplayer . . . . but it is Joe, through no effort of his own, who captures the imagination of the fans." By his third year in the major leagues, Joe was demanding $40,000 — more than the Yankees were willing to pay. After a standoff, he had to swallow his pride and settle for $25,000. Maybe the Yankees never would pay him what he was worth, but as long as he kept winning there was money in just being Joe. Days were spent on the field; nights at Toots Shor’s nightclub or on the dinner club circuit. It looked like Joe had it all: stardom, money, a penthouse on Manhattan’s West Side — and a baby boy on the way with his wife, Universal Pictures’s "Oomph Girl" Dorothy Arnold. But a month into the 1941 season, Hitler was firebombing London and worries spread about America’s entry into the war. Once again, Joe gave the nation something to feel good about: From May 15 to July 18, he hit in 56 straight games. By the time it ended, The Streak would be part of baseball history. Yet even Joe’s fame couldn’t keep his marriage from crumbling after just three years. "He was very jealous," recalls Dorothy’s sister, Joyce Hadley. "He would take off at night and go out, leave her alone and just ignored her. He’d get upset with something, and wouldn’t talk to her for days at a time." Age twenty-eight, Joe joined the army and spent the war playing baseball for Uncle Sam. But killing time in his quonset hut, Joe seethed. "The way he saw it," says Cramer, "the war had taken his whole life — and cost him $130,000 in big-time, big-league wages." In 1947 the hero machine’s potent new engine, television, made its debut. Against the odds, against time and age, Joe clawed his way back to the top in front of the largest audience in baseball history. Now he was Broadway Joe, squiring showgirls at the Stork Club, living like royalty. 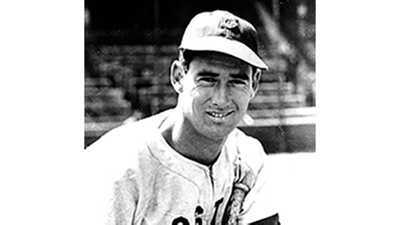 After the 1951 season, at age thirty-seven, he left baseball — the biggest winner in its history. Before long, he landed in the gaudy world of his new girlfriend, Marilyn Monroe; they married three years later. 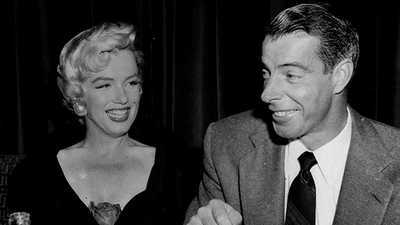 DiMaggio was crazy about Monroe, but he couldn’t handle the role and couldn’t stand her world. Their marriage lasted 274 days. Eight years after their divorce they were going to remarry, and then she died. "The fame had eaten up his life," Cramer says. "And now it took from him the one person who might have understood." DiMaggio, on his own, had become an expensive commodity. "He could scarcely walk out his front door without being paid," says Cramer. But who were the millions for? He barely spoke to his son, Joe, Jr., who ended up homeless in California. In March 1999, DiMaggio died as he had lived: revered, extolled, subject of a frenzied commerce, in a national floodtide of sentiment. He had lived the hero’s life for 65 years. Bruno Bernard, courtesy Bernard of Hollywood Pub.,Renaissance Road, Inc.
David McCullough, Series Host: Hello and welcome to The American Experience. As anybody could have told you in the 1940's and certainly any kid who loved baseball — there was no team on earth like the Yankees. They were it, tops, the best. As New York was the biggest, greatest city in the world, or the Empire State Building the tallest skyscraper ever, so the New York Yankees were the greatest team that ever was or probably ever would be. And they looked the part. That was one of the rules if you played for the Yankees. You dressed right. You kept your hair cut. On the road you tipped the waiters properly — 25 cents for breakfast, 50 cents for lunch. On the field there was only one rule really, one creed: no mistakes. The Yankees meant perfection, and in the 1940's the perfect Yankee was Joe DiMaggio. That's how this tall silent man outshined them all, doing everything perfectly. And that is what ate away at him inside. Joe DiMaggio had to be perfect. "Joltin Joe!" In his amazing hitting streak, he struck out only five times in 56 games. In Pittsburgh we had a DiMaggio playing the out field for the Pirates, Joe's brother Vince, who was known affectionately as the strike out king. But he was a DiMaggio. That was enough. Vince, who loved to sing and talk, once told Joe, "If you could talk like I do and I could hit like you, we'd both be famous." Joe was one of nine children, born dirt-poor, the son of an illiterate Italian fisherman, and at a time when Italian-Americans were looked down on. Importantly, he became the ultimate baseball hero when baseball was the game, and for all his troubles later, he was a hero still, to the last…Joe DiMaggio by producer Mark Zwonitzer. Justice Edwin Torres: He was always so immaculately dressed. 6 foot 2 with those shoulders, you know what I mean. Sonny Grosso/Judge Torres: Always had that, I wouldn't, I wouldn't say austere, but he had a kind of majestic qual — almost a royal, royalty quality. Judge Torres: Yeah, that's the word, elegant. He was superbly elegant guy on, on a every level. Maury Allen, Biographer:It seemed as if he was walking on air. He would glide through the stadium. He would glide through a restaurant. Frank "Spec" Shea, New York Yankee pitcher, 1946-1951: People used to pile around him like it was, like he was God Almighty. And everybody loved him and it was Joe DiMaggio and that was it. Narrator: No wonder we strove for more than sixty years to give Joe DiMaggio the hero's life. From his debut at Yankee Stadium in 1936 until his death in 1999, DiMaggio was, at every turn, one man we could look at who made us feel good. That's the way the hero game worked. It was always about us. It was about how we felt with Joe. And he knew that. But we never heard him complain. He knew what the hero's life cost. But he also knew how much it was worth. Dario "Dempsey" Lodigiani, North Beach pal: Joe made it a point to come out last all the time so he would be by himself when he came out of the dugout. And the people, naturally: 'Hey, there goes Joe DiMaggio see. There's Joe DiMaggio going by,' see. Made it a point to let everybody know it. Geta Spatola: The dirt was still on the spikes. Bina Spatola: I never cleaned them. They were just the way . . .
Geta Spatola: And the newspaper. He had lined them with velvet before he encased them for us. And after, you remove the velvet, the newspaper that stuffed the spikes was from that 1941. Bina Spatola: 1941. But the velvet was actually casket fabric. Geta Spatola: And we took them to…We took them to little league ball games and had all the kids rub the shoes for good luck. Bina Spatola: We used to have the children put their feet in the shoes (laughs) for good luck. Narrator: Even as a boy, Joe DiMaggio never said much. Guys in the North Beach neighborhood got the feeling Joe was saving words like he saved his money. He never would spend either. Carlo "Hungry" Geraldi, North Beach pal: We just called him Joe. I mean he… he was a loner, anyhow. He was a loner. He was by himself all the time. He was by himself. I don't know why. Frank Venezia, North Beach pal: He wouldn't do anything he didn't want to do, believe me. And he, he really didn't need anybody. You know what I mean. Vince Marino, North Beach pal: Joe was like I was. It burned in his pocket. He had that money in his pocket, he would never pull it out. Narrator: Most families in North Beach were only scraping by — and that was before the Depression. But even among those cash-poor fishing folk, the DiMaggios stood out. Giuseppe DiMaggio's boat was too small to operate outside the Golden Gate. That's where the crabs (and the money) lay — beyond Giuseppe's reach. Vince Marino: They were really very poor. Because the father was not a fisherman that fished like our dads. Our dads went out for crabs and salmon. His father was a fishermen…was a bait fisherman — in the Bay. Frank "Ciccio" Larocca: Joe's father was a little short man. He was kind of roundish. Typical of fisherman, like anybody else, you know had a sash around their belly to hold their pants up. Vince Marino: He was a quiet old man. He was quiet. He'd go down to the wharf and nobody would know he'd be there. Narrator: Giuseppe DiMaggio was born to backward isolation — on an island off the coast of Sicily. Even after decades in America he had only a few words of English, none of the skills of the machine age, and nine children to feed. He worked every day to put food on the table, made a little wine in the basement, and kept his troubles to himself. Frank Venezia: Seem like the DiMaggios were just for the DiMaggios. I mean they made a living, but it was nothing to brag about. As soon as the boys got old enough, they all had to go out and help some way. Hungry Geraldi: He sold papers on Sutter and Sansome, there, the old Anglo Bank there, used to be the old Anglo Bank . . .
Vince Marino: I think we made about a dollar, dollar and a quarter, a dollar and a half a day. Between the three brothers, they must have taken about 4 dollars home a day. You know, it kept the families going because things were tough then. Hungry Geraldi: After we sold papers, we used to go to the restaurant and we used to get a little bowl of beans for five cents. And what pennies we had left over, we used to pay the pennies up against the wall, and see who would win the pennies. And every time, he would win. Ciccio Larocca: We used to play cards for nickels and pennies. And Joe always won. He was a good player. Anything he put his hands on, he played well. Vince Marino: Most of times Joe won, because we cheated a little bit. He put his foot under the table and then, and if he needed a deuce he'd hit my foot with one two, and I'd give him the deuce, you know, come around and give him the deuce. If he needed a four, he'd hitme four times, one two three. By the time we got through playing cards, I needed a new shine. Narrator: Joe liked any game where he could shorten up the odds. Baseball — he knew he could win that, for sure. Every kid would throw in a nickel or a dime. They'd play winner take all at the North Beach playground. Ciccio Larocca: That was tar. Asphalt. And we used to play on that. Ripped your pants and everything else. Oh, I'll tell you, it was terrible. Dario Lodigiani: Joe never said two words, but he played hard. He'd hit a ball past an infielder or in between the outfielders, he'd round first and he would slide on that asphalt. And good night, that would take a little hide off your sides, you know. But it didn't mean anything to him. He just wanted to be sure he got to second base. Vince Marino: Joe would get up there and just hit that, just get up there, boom. That ball would go right over Columbus Avenue from Taylor Street, to Columbus Avenue, damn near to Jones Street. That's how hard he'd hit the ball. Narrator: Papa DiMaggio didn't think much of baseball. Too many pants. Too many shoes. And what was it good for? Play with a ball instead of bringing money home, like a lazy bum, magabono. The odd thing was, Joe looked at baseball the same way. It was the kind of thing other kids could afford, like school. Frank Venezia: We were lower class, you know. There seemed to be a higher class of students, you know. We were fishing people, so-called poor, you know. But, if you wanted to learn, many did, you know. It just happened to be that we didn't care. Dario Lodigiani: Joe just didn't like school. When he graduated from Francisco Junior High, he went to Galileo High School and he only stayed there about a couple of months or something and then he left. Narrator: When he bombed out of school at age 15 — no one even noticed. Joe played hooky, didn't look for a job — what job would he want? All he wanted was to have a few bucks in his pocket — and to stay off his father's boat. Vince Marino: Every time Joe's dad came near him he ran. He didn't want to get near the boat. Joe didn't know how to fish. I don't think Joe knew how to do any work. I never seen Joe do any work. Narrator: In the end, it was baseball that saved Joe from the sea. The neighborhood boys got a sponsor for their team, Rossi Olive Oil. Frank Venezia made the pitch to Joe, all excited. They were going to have uniforms — and real shoes! Joe signed up for the shoes. Even so, he only played with Rossi a few months. Frank Venezia: Joe was playing for us. And he hit a home run, real wallop. Artie Baumgarten was there and I just turned and happened to see him give Joe two dollars. And next week, Joe was playing for his team. That's his first pay he ever got in baseball. Two dollars. Narrator: Soon Joe was a hitter for hire on semi-pro teams around the city. And he was big news. In 1932, he got his first tryout with the San Francisco Seals. That was the Pacific Coast League, the closest thing to major league ball that was anywhere west of St. Louis. From that moment — even before he made the Seals — ball bat and glove weren't for play anymore. Baseball was going to put real money in his pocket. Joe bent his life to the game; he'd never had any coaching . . . but now he learned like Mozart learned the piano: all at once, and instantly. Vince Marino: Baseball, baseball, baseball. He ate — ate and slept baseball. 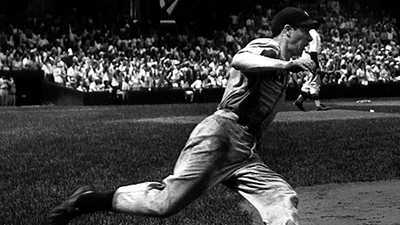 Joe DiMaggio, when he playing ball, he knew what he was doing. He knew every move. Frank Venezia: He had everything. He could throw. He could field. He could run. He could, he could do everything. And I think deep down he knew he had it, you know. But he never bragged. He never talked about it. Narrator: Joe wouldn't spend a minute on talk. He was eighteen now, and in a hurry. Before the newspapers could spell his name, DiMaggio was hammering the Coast League pitchers. He hit in 30, 40 straight games. His name was bannered across the same papers he was selling just the year before. By the time his streak ended at 61 straight games, major league scouts were aswarm at Seals Stadium. Two days before his twentieth birthday the Yankees bought DiMaggio, to bring him to New York, the big-time of the big leagues. For Giuseppe — as for his friends — there was only one way to describe it: a Miracle. Here was a boy who didn't want to work — unlettered, unskilled, barely compliant — and now he'd be paid more than the mayor of San Francisco . . . to play with a ball. Giuseppe Dimaggio: Make-a da muscle. Hitta da homerun. Joe Dimaggio: Listen, Dad. Listen. Judge Torres: Sonny Grosso — Joe DiMaggio. Sonny Grosso: There you go. And when they show this to DiMaggio, he said, where does it say Grosso gets . . .
Sonny Grosso: Top billing. Top billing. Judge Torres: So, you know, when I first saw the chair, I said, this chair's a little out of synch with the motif here. What is this chair? And now I realize it. Oh my God. Sonny Grosso: So my dream has come true in my life time. Not that I don't want to meet other people, but I don't have to meet anybody else. I have, I have reached the pinnacle and had dinner with DiMaggio for four hours. And thank God, the guy upstairs let it happen. But it was, it was the height of my life. And he's been my hero my whole life. And, most kids and most people and most adults never get that opportunity. But I did. NarratoR: Joe DiMaggio tall and slender, hawk-faced and buck-toothed, slow to smile and wary of strangers, left his home in San Francisco in the winter of 1936 — to seek his fame in baseball. He'd never even seen a major league ballpark, but the hero machine was already gearing up for his arrival. The great Babe Ruth was gone, and the Yanks hadn't won a pennant since — three years out of the money! Attendance was down and so were newspaper sales. At the Yanks' spring training camp, St. Petersburg, Florida, Joe was awaited by a flock of sportswriters — all starved for copy. 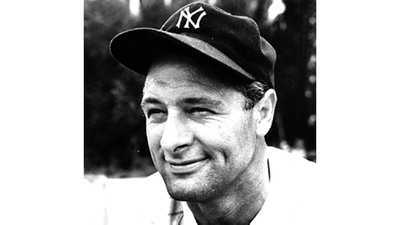 Maury Allen: In 1936 Lou Gehrig was the great star. But Gehrig had been around since 1923. So everybody knew about him. Sure, the Iron Horse and the streak was going and he was a great hitter and a great first baseman. But they had written all of that hundreds of times. They wanted something different, new, exciting. Narrator: Exciting they'd make him — with his help, or not. As Joe came onto the field, they shouted, 'Joe! How'bout a quote?' "Don't have any," Joe said, as he trotted by. He didn't know what they meant - thought Quote was maybe some sort of soft drink. No matter. They all knew what the story was. As Dan Daniel wrote in the next day's World Telegram: "Here is the replacement for Babe Ruth." It was those writers' job to make drama, to make larger than life. They were going to make this West Coast boy into a hero — or a Dago clown. As spring training wore on, it looked like stardom for sure. The Yankees crowed, this kid was worth every penny. Writers called him the saviour of the team. Then, before the season began, Joe got hurt. Maury Allen: Every day, people went to the ball park. Is today the day? Is today the day? Are we going to see this kid? Is this kid really going to finally put the Yankee stripes on and get out there and, and play in the outfield for the Yankees. And finally he did break in. He broke in with a tremendous game. He got three hits in his opening game. And it electrified every baseball fan in New York. Narrator: With Joe in the lineup for a week, the Yanks took over first place — and never looked back. They dethroned the Detroit Tigers, and clinched the pennant earlier than any team in history. The Yankee captain, Gehrig, had one of his greatest years — 49 homers and 152 runs knocked in. Larrupin' Lou was the league's MVP. But DiMaggio got the cheers. It was the San Francisco Italian kid who spurred the Yanks to be champions again. When they won the World Series — in six games, from the Giants — the town, the nation, everyone from schoolboys to the president of the United States — had to salute this rookie star. "When it comes to personal magnetism, you've either got it or you ain't," as the Daily News' Jack Miley wrote. "Gehrig is a helluva ballplayer . . . but it is Joe, through no effort of his own, who captures the imagination of the fans." It wasn't just newspapers now. . . but radio, newsreels, glossy magazines. The shy and silent Sicilian kid landed in a million parlors, big as Life — that new picture magazine that debuted the same year as he. In fact, Joe was the first one we knew like a friend — he was in our lives - his stance, his smile, the woes of his famous and fragile body, the quaver of his voice. 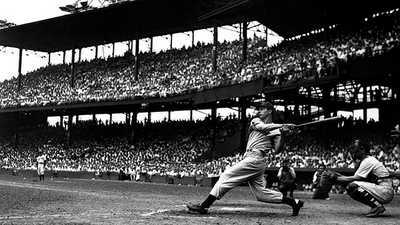 Joe Dimaggio: Well, I'm just taking my natural swing at the ball, but naturally I would like to break the uh Babe Ruth's record of 60 home runs. Sonny Grosso: As an Italian growing up in East Harlem without a lot of Italian heroes, he became like the first big hero for us kids. And DiMaggio not only was a hero here. He was a hero in Italy. People knew who DiMaggio was in Italy. So my father was very, very proud to show me who this DiMaggio was and what he could do. And I remember that we had box seats. And my father sold the box seats to get us seats in the bleachers so we could watch DiMaggio. Narrator: What swelled the pride of the immigranti wasn't how Italian this new star looked, but how American. DiMaggio was the hero of America's own game. In the Thirties, Major League Baseball was a point of excellence and glamor in a nation that didn't have many such points to enjoy. The only other big-time professional sport was boxing — hardly a wholesome pastime. And Joe Louis could only fight Schmeling once a year. But baseball was there every day, as present as the weather — and as much discussed. Maury Allen: Baseball was played on every lot, in every farm, in every city in America. Every 8, 9, 10, 11 year old kid thought of himself as a potential major leaguer and someone who could actually get his photograph in a newspaper, could actually be asked for his autograph, could actually be paid, by God, to play this game that we're all playing for fun. Narrator: Hero worship wasn't just for boys. Big guys in New York idolized DiMag. For example, Bernard "Toots" Shor, who was bigger than most — along with boorish, insulting — and loud. In his saloon, Toots Shor was host to the hero machine: athletes, writers, radio men, fight promoters, bookies — not to mention the actors, pols and Broadway brokers. Toots fed 'em all ...and lubricated the machine with booze. Maury Allen: There was no bigger status than being one of Toots's crumb bums. 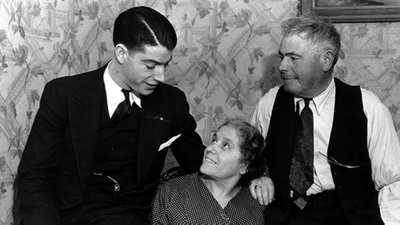 And Toots Shor would identify DiMaggio as a crumb bum to other people and that meant that this kid had really arrived on the scene in New York City. Joe soon found out that he liked that kind of life. He was not a home body. He was not a guy who would sit in an apartment and read a book or listen to the radio. He was a guy that wanted to go out to dinner with Lefty Gomez and go to the right restaurants, be fussed over, and have his ego stroked, and have his vanity played up to . . .
Narrator: All Joe had to do was show up. That was the beauty part. Toots would talk for him. Hell, you could hear Toots anywhere in his saloon: "Gehringer better than the DAGO? Don't advertise yer ign'rance!" If Joe D. didn't walk on water, no one had told Toots. The problem was, Joe kinda believed it, too. He was money in the bank. So where was his? For his third year in the bigs he demanded the titanic sum of $40,000 to play. And when the Yanks refused, Joe stayed put in San Francisco; he was a restaurant owner now too. In those Depression days, Uncle Sam paid twelve hundred bucks for a year of hard work. Most third-year major leaguers were making three thousand — maybe five thousand, tops. Joe didn't care. He was worth all the dough. For the first time since Ruth's retirement, the Yankees had drawn a million fans. Joe was their hero, wasn't he? 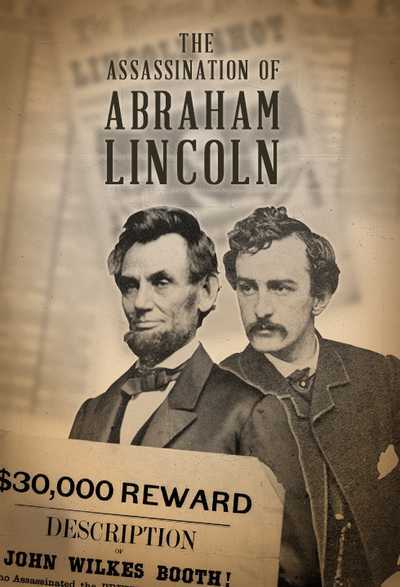 The Yanks, he said, would "have to pay – or else." Dario Lodigiani: If I don't get what I want, he says, I'm going to go back to fishing. And, Geez, when I read that, I started to laugh. I said, Joe can't go by, underneath, the Golden Gate Bridge. How in the heck is he going to go fishing? Narrator: When Joe finally folded, and took the Yankees offer of twenty-five thousand, the club owner, Col. Ruppert, crowed: "I hope the young man has learned his lesson." Joe had to swallow his pride to come back. Then he had to swallow worse. It was the boos, Bronx cheers — the hate! They were sending him threats in the mail, throwing things at him from the centerfield stands. At night, Joe would pace his hotel room, unable to sleep and unable to go out. He'd be spotted for sure. 23 years old and acid was eating away at his stomach. 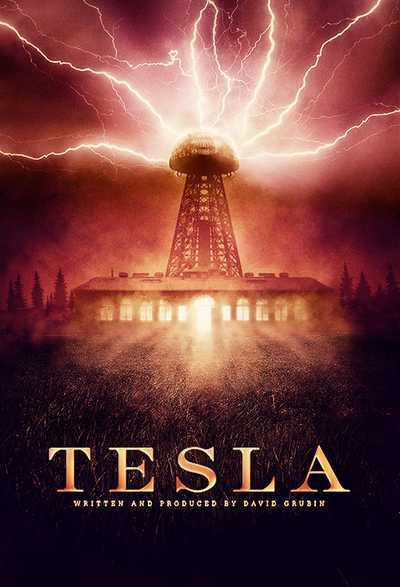 He'd learned a lesson, all right: how fast the machine could turn ugly — when he wouldn't play ball. It'd be different if Joe could talk his way out of things — he wished he could. But Joe could make his case only one way. Tommy Henrich, New York Yankee Outfielder, 1937-1950: DiMaggio rolled every day. Every day something happened. And he just plain stood out. Bina Spatola: He was so smooth and so fast. I mean, I don't know. It was something about him that's just graceful. Geta Spatola: He was so graceful. I mean, that stance at the plate, I can, I can see it in my dreams. I mean it was unbelievable. Bina Spatola: And when he would stand there, he would never wiggle the bat. Judge Torres: Once I recollect seeing him in the stadium hit a line drive, past the third baseman — which the guy, the third baseman never took his hands off his knees. That was the velocity of that, of that liner. Tom Henrich: He knew the doggone game as well as anybody. And he would, he would give you the absolute best he had in his body all the time. I can tell you Hall of Famers that people think are better than DiMaggio. But if you want to play a game of ball and win at the end of nine innings, take Joe. Dario Lodigiani: He was really a in a way you'd have to say, a mean ball player I remember one game we're playing in Yankee Stadium and Joe was at bat and he hit a ball to left center. And he rounded first base and he come into second base and they're throwing the ball at me. I'm covering the play. When I caught that ball, I thought a train hit me. You know, I tagged him and he plowed into me and knocked me over on my back and everything. And I got up and I said, 'Hey Joe, what's going on here?' He didn't say nothing. He just brushed his pants off and ran over in the dugout. And I said, well, if that's the way he plays ball, you got to be careful when he gets on base. Narrator: Nothing would stop Joe from grabbing what was his - and that was the acclaim of a winner. The Yanks won four straight world series since he came up. Maybe the club would never pay him what he was worth. But as long as he kept winning there was money in just being Joe. The Dante Circle Italian club, the Columbus Society of Northern New Jersey or of Cleveland, Chicago, Detroit, it was the same. Joe would go out to dinner, maybe stand up and say thank you at the end. He'd come home with a new suit, or a traveling bag. Sometimes it was even better than luggage . . .
At Yankee Stadium they gave him a diamond-encrusted watch. At a dinner for a thousand fans in Newark, they gave him a Cadillac. Joe owned Newark. Everybody wanted the Yankee Clipper — like the boss of the first ward rackets, Richie "the Boot" Boiardo. What an ornament to Richie's operation was Joe. And Richie returned the favor — with ornament, for Joe's new bride-to-be. Richie the mob boss threw open his safe where drawers full of diamonds glittered. "Take what you want, Joe. Whatever you like." Geta Spatola: She definitely was more striking than he would have been, you know, if you didn't recognize who he was. But, she was beautiful. She was a starlet. A movie starlet. Geta Spatola: Starlet. They called her a starlet. She was not very well known at the time, you know. Bina Spatola: She was a really beautiful woman. Beautiful. Geta Spatola: I remember her name was, her stage name was Dorothy Arnold. Narrator: It was ambition that took Dorothy Arnoldine Olson from Duluth to Chicago and on to New York. She was brave, willful, and full of hope; by the time she met Joe DiMaggio, at 19, she was already a showgirl on the rise. Joyce Hadley, Sister-in-law: There was man by the name of Mort Milman who saw some of Dorothy's work and he felt she had a lot of talent and so he wanted her to go to California and have a screen test. So Dorothy did. And she was picked up by Universal pictures and she was Universal's ooomph girl. Dorothy Arnold (voiceover): I've been after that box of Zorka's since the moment he was found dead. I'd have had it and got a price for it by now if you'd left me alone. .
Narrator: Maybe she would have been a movie star . . . but when things with Joe started heating up, Dorothy had to decide where to put her oomph. Joyce Hadley: Well, my sister Dorothy came home from New York and she was sporting on her ring finger a four-karat emerald-cut diamond. It was humongous, so to speak. And that was it. They were engaged. And her career sort of took second place for a time. She was trying to help Joe in using words and feeling more comfortable. He would talk if you asked him a question. But, as a rule, he was not comfortable in the company of a lot of people. Narrator: Well, nobody said it would be easy . . . but a girl had to admit, being Mrs. Joe DiMaggio wasn't going to be a half-bad role. Newsreel: What's going on here? Looks like a riot, but it's just a wedding. Baseball's Joe DiMaggio's wedding and to 30,000 in San Francisco's Little Italy. Dario Lodigiani: My God, it was the biggest wedding in the history of San Francisco. Knowing that the favorite son at that time was getting married, everybody was there. Good night. And they had the place roped off and all. And it was really something. Ciccio Larocca: I was an usher in the wedding. Oh, it was beautiful. Never saw anything like it. They had ballplayers sculpted in ice and you could see them getting smaller and smaller as the night goes — they just melted away, you know. It was beautiful. Narrator: Beautiful is how it looked, as Joe and his bride settled in. He was 25, she 22, and they had it all: stardom, money to burn, a penthouse on Manhattan's west side. And then, too, a baby boy on the way. Strange to say, it looked like Joe had a case of the jitters. A month into the '41 season, his average was barely .300, and dropping. The Yanks were in fourth place and losers of four straight. The whole club seemed to have the shakes. For that matter, the country had 'em, too. Hitler was running amok in Europe, London shuddered under the bombs. The grim truth was, America would soon be at war. It was Joe DiMaggio who gave the nation just what it needed. Something else to talk about. That May, he started on a consecutive-game hitting streak unmatched to this day.By the time it was ended, The Streak would be part of baseball history; and Joe DiMaggio would be part of American history. His life would never be the same. He built that streak in the archetypal DiMaggio way: day by day, alone, without talk, and in the end, under intense public pressure. It started quietly, through fifteen, then twenty, then twenty-five games. When the streak got into the thirties, fans finally began to take notice. The record went back before the turn of the century — 44 games straight by Wee Willie Keeler. As Joe neared 40, newspapers from all over the country dispatched reporters to follow the story. The Streak almost squeezed Hitler off the front page. The wires were running bulletins of Joe's every at- bat, and flashes (ten bells!) when he got that day's hit. Suddenly, Joe's battle was our battle. And his triumph would be ours. Judge Torres: Well, it was a like a collective hysteria about that streak. I mean, people in the subways — strangers would talk to one another about it, you know. Did he hit one today — you know, that sort of thing. Sonny Grosso: Did he get another hit? Did he get another hit? Judge Torres: That was, that was unbelievable that thing. Narrator: The day he went for the record Dorothy was in the throng at Yankee Stadium — with writers and photographers assigned to record her every peep. Now, at last, here was the limelight that had lured her from the good Midwest. When Joe came to the plate in the fifth, Dorothy rose and acted her anxiety. When he hit a home run, her words made ten million papers. As always, she spoke for them both. "Beautiful, wasn't it?" Maury Allen: Every day the streak went on. 45, 46, 47, leading the papers, leading everybody's conversation. The entire country seemed to be emotionally involved in this streak which, at one time when it got to about 50 or 52, seemed endless. Judge Torres: What can I say? He was the closest thing to an icon at that time. We'd repair to the Fox Star on 107th Street and Lexington Avenue. And it was a dime to get in and then, probably you'd see King Kong on the screen. And then the Movie Tone News would come up. And then you'd see, invariably you'd see DiMaggio, you know. And then a cheer. A cheer would go up in the theater, you know. There would be a cheer at everything he ever did. He was just the man. Sonny Grosso: the love that people had for DiMaggio was universal. Narrator: By the time the streak ended at 56 games, Joe DiMaggio belonged to us. News of him had jumped from the sports page to the front page . . .We wanted to know everything about him. And that was his dread. In the middle of it all, Joe was wound tighter than ever. He was ulcerated, coffee-jangled, sleepless and lonely. He had millions of fans, thousands of acquaintances, hundreds of pals — and not one friend in whom he would confide. 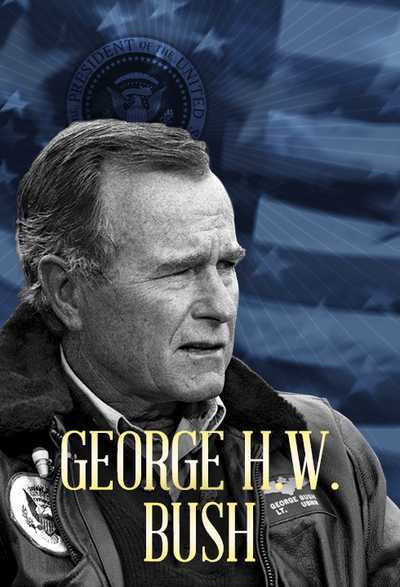 He was the most famous man in America, a man at every moment watched. And there was so much about his life that he didn't want anybody to see. Geta Spatola: Well, when Joe and Dorothy Arnold were going to be married in November of 1939, my mother and dad were invited to the wedding in San Francisco. Dad took his 16 mm camera into the church to film the wedding which was a candlelight wedding and the whole church was in darkness except for the candles and that's all he got. Bina Spatola: Was the candles. Geta Spatola: Mom came back from the wedding — she was in the picture with a big red hat on, when she came back from the wedding — she presented this piece of wedding cake to Bina because she knew Bina was keeping all this stuff. And it was wrapped in cellophane. With two paper clips. Bina Spatola: She wrapped it with paper clips. Bina Spatola: But she also brought the two columns. Geta Spatola: There were columns and roses. Bina Spatola: The bisque column and a rose. And, in my scrapbook, the picture was there with these pieces. So it all authenticated, the cake and everything. Geta Spatola: It was perfectly preserved. Perfectly preserved. Bina Spatola: The cellophane must have preserved it. Geta Spatola: If you ever want to preserve anything, put it in cellophane with two paper clips. No scotch tape. No saran wrap. Bina Spatola: We didn't have scotch tape at that time. So that's the way she wrapped it. And it stayed perfect. Narrator: Joe DiMaggio wasn't going to let anybody see that marriage was eating a hole in his stomach. That ulcer again. When Joe Jr. was born, in October '41, Dorothy hoped her husband would settle in and settle down. He thought maybe Junior's arrival might finally keep his bride at home. She was still talking about a comeback movie. Joe thought: How's she going to get a part? He knew about the casting couch. He said, "I don't want her to do the things she has to do to get ahead." If they did go out, Joe'd take her to Toots Shor's, where you could bring your wife, if you didn't make a habit of it. And if she was decorative and not too loud. Dorothy was loud. Mostly Joe left her home. Joyce Hadley: He was very jealous. There was one episode where he didn't like the dress she had on and he told her to take it off. He didn't like the plunging sweetheart neckline and he said, "Take that G.D. dress off." Geta Spatola: Dorothy was just as beautiful as ever, but there wasn't any glamour about her at that point. She was strictly, you know, at home. And he was, at that point, getting out a lot more. Joyce Hadley: He would take off at night and go out, leave her alone and just ignored her. He'd get upset with something, he wouldn't talk to her for days at a time. Dorothy couldn't handle it anymore. Narrator: They'd been married three years when she ran off the first time — middle of the '42 season — and Joe sank like a stone. First time in his life, he was batting .250. That's why the Yankees had to get her back. And of course, all the writers had a field day with that. After that season, Dorothy high-tailed for Reno and a quickie divorce. Joe had to go out and beg. That made all the papers, too. The worst was the speculation that Joe only patched it up to protect his draft status — married, father of one. When that made the papers, Joe had to sign up before they called him a coward in the headlines. Newsreel: Joe, age 28, waives his 3-A draft status and asks for immediate action. The slugging outfielder of the New York Yankees is pronounced in perfect condition, so the 50-thousand-dollar-a-year Joe DiMaggio becomes a 50-dollar-a-month guy named Joe. DiMaggio says, "I just wanted to do my part." Narrator: A year and a half later Dorothy left him again – and this time, in open court, she called him indifferent and cruel. Joe was too proud to fight her in public, and too proud to give her up. She was his. But what could he do about it now? Sgt. Joe DiMaggio was shipping out to Hawaii. . . . As wars go, Joe's was a piece of cake — a little baseball, and a lot of feel-good publicity for Uncle Sam. Newsreel Reporter: How do you like playing for the Army, Joe? Joe Dimaggio: I don't mind it very much at all. As a matter of fact, I'm quite enjoying it. Although I'm looking forward someday to getting back with the Yankees. Narrator: But killing time in his quonset hut, Joe seethed. The way he saw it, the war had taken his whole life . . . and cost him 130-thousand dollars in big-time, big-league wages. Dario Lodigiani: I remember we was laying in the barracks one day and just talking and he says, when I go back, they're going to pay me. And I said, well, Joe, the GI Bill of Rights guarantees you your job back, your salary back and everything. He said, yeah, but they're going to pay me for the three years that I spent in the service. Narrator: DiMaggio meant to grab hold again of everything he'd lost. Before he'd even got out of the Army Joe prevailed on the generals to post him to Atlantic City, where the wartime Yankees just happened to train. And not too far from York — home to Miss Dorothy Arnold, and Joe DiMaggio, Jr.
Joyce Hadley: He was still trying to get back in Dorothy's life, even after they were divorced. I remember she had this book called "How To Improve Your Word Power." She gave it to Joe to read. And so this particular night, we were going to go out to dinner. And Joe said, "Let's go to Longchamps and get some of that insatiable food." And, you know, he was trying. Spec Shea: He never ever gave up on nothing. I'd go out with him and I'd hit him fly balls to the outfield. Line drives, anything at all. Just keep hitting to him, you know. And then when he was having trouble — he thought he wasn't hittin real good, he'd hit there until his hands were all blistered. Narrator: Spring training 1946, Joe was back in pinstripes, and battering the fences. He said Dorothy was waiting for him in New York. He said they were getting back together. He said . . . well, he said more than he ever said before. He was like a kid, like he'd learned to smile. Then before the season even started, Dorothy dumped him. . . to marry a stockbroker. Now, baseball was all Joe had. And even that didn't feel so solid. For the first time in his career he would finish the season below .300. And the Yanks would finish a distant third. Maury Allen: He was 31 years old, 32 years old. He didn't have the same skills, of course, that he had before the war. It really damaged his career losing those three years. 1946 was a very tough season for him. Jerry Coleman, New York Yankees Second Baseman, 1948-1955: I think it ate him alive at times. If he didn't perform, if he didn't do the job, if he didn't think that he was better than everybody else and he did it better than everybody else. I don't think that worked for him. I really think he had to be perfect and it's impossible. Narrator: Joe couldn't put his world back together. This was a new age: night baseball, air travel, every game on the radio. The Yankees had three different managers in '46 alone, and new owners - would they know how to win? How could Joe win, with bone spurs in his heel now, an open wound where the surgeons sawed away? When the '47 season began, DiMaggio couldn't even walk. He'd look down the dugout bench and suddenly, half the team was kids — looking at him to make them winners. Maybe he would if his old bones permitted. But he'd sure as hell make them Yankees — with a dose of that old- time pinstripe religion: No Mistakes. Spec Shea: He'd say, you know, like, say, for instance, I pitched that day. He'd say okay, we had a meeting before the game and you said you were going to pitch this guy inside and you pitched him outside a couple of times. And you had the outfield in the wrong position, the infield in the wrong position, and therefore, we let that ball get through us and we had to break our necks to get over to keep him from going to two bases because you pitched the wrong pitch. You made the wrong kind of a pitch. And, you'd say, well, the ball got away from me. It shouldn't get away from you. You've been in the major leagues now. You're here — and this is where you gotta, you gotta do these things perfect. Jerry Coleman: He always talked quick, you know, very sharp. He didn't, didn't spend a lot of time communicating. But his command, his presence, his stature on the field – you know, one word, one grump, one look spurred you on. . . . I've had people say to me, boy that must've been a lot of fun. I say, you mean that death struggle we had everyday. Because we either won or we lost. There was no second place. Announcer: There it goes! . . .
Narrator: Back in the lineup at last, Joe went on a tear in May — he hit almost .500. Around the All-Star break in July, the Yanks won 19 straight and Joe was the league's number one hitter — first time since 1940! DiMaggio led the Yankees back to the pennant — and a shot at another world title. Announcer: To Yankee stadium comes the biggest crowd in baseball history for the first game of the 44th World Series. Narrator: That series was an all-New York affair, the Yanks against the Brooklyn Dodgers — and their new star, Jackie Robinson. Narrator: Nineteen-forty-seven also marked the baseball debut of the hero machine's potent new engine: television. 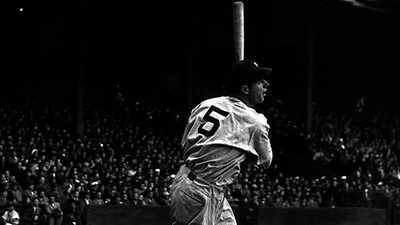 In front of the largest audience in baseball history, DiMaggio showed America he still had it. When the Brooklyns drew even at two games apiece, it was Joe's home run that won game five, and put the Yanks on top. Spec Shea: We come back into the clubhouse and we're sitting there and DiMaggio comes over and he's so happy about the whole thing, he gives me a big kiss. He said, "Boy," he said, "Frankie, you pitched one helluva ball game today." And I said, "Yeah, but if it wasn't for you, we wouldn't have won it." That home run was something else, you know. Joe Dimaggio: I never figured it'd go seven ballgames, I'm tickled to death however that it did go to seven, and we did win it. Narrator: Against the odds, against even time and age, Joe DiMaggio had clawed his way back to the top. Of course, we looked on and never saw the struggle. Our hero had to win with the favor of heaven, not with clenched teeth. America had come through Depression and war; now we were flush. We didn't want to know about struggles. This was our age of ease, wealth and power. And there, right on cue, was our postwar hero — rich, elegant, strong, a winner. He was our Broadway Joe, squiring those free and easy showgirls at the Stork Club. Of course, they paid him to show up at the Stork Club. Narrator: He lived like royalty, with courtesans great and small. Toots always had his table ready, where Joe could be seen, but never touched. Anybody bothered Joe in his joint, Toots would be there: "Get outa here before I bounce y'out." Even men of sense and substance gave over their lives to serve Joe: to carry his bags, meet his train, get him tickets — or a blonde. These favors Joe saw as his due. He played the game – and played it full time. And Joe understood the bargain: we would give him anything – if he always looked like the hero we required. 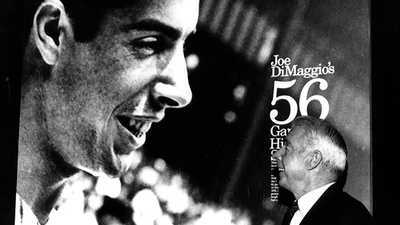 Maury Allen: Joe DiMaggio was probably during his playing time – and maybe for the rest of his life — one of the most elegant human beings in the world. There was never a hair out of place. He never wore a suit that didn't fit. He never wore a pair of shoes that weren't shined. Ciccio Larocca: Joe was immaculate. Oh, every time we went by a mirror, he, he used to look in the mirror and see how he looks. How, how is my shirt? Look alright? How's this and that. Maury Allen: "Joe you look great." That's what people would always say to Joe. There's an old story that Toots Shor used to tell that when Joe DiMaggio died they would lay him out at St. Patrick's cathedral and 200,000 people would walk by his casket and everbody would say the same thing, "Joe you look great. Joe you look great." Narrator: Joe said he hated the attention — but he wouldn't give it up. What else did he have? His marriage was gone. And he barely knew his only son. Joe didn't even talk to his little brother, Dommie, who played center field for the Boston Red Sox - he robbed Joe of too many hits. Narrator: See, in the hero game, you couldn't just hold on. You had to win every year, every day. And in his last three seasons — championship years every one for the Yanks – there were some days Joe could barely get out of bed. Spec Shea: Someone would say to him, Joe, are the heels bothering you. "Ah, they're alright." And he had other injuries too. He had his back. His back was bothering him, one time, and he never wanted to come out of the ball game. You know. He always wanted to say, "No, I'll be alright, I'll be alright." And he'd manage to get two or three hits in them games and you'd say to yourself, when a guy is such, in such bad shape, how is he doin' so good? Maury Allen: By 1949 the Yankees were Joe DiMaggio's team. You could not establish yourself on that team unless Joe gave the nod that you could play hard and you were one of our guys and you could help us win. Now here comes Casey Stengel who immediately took over the personality of the team. Talked a great deal about himself. Talked a great deal about his managerial genius. And Casey's great line was when he won the pennant that year, he said, I never could have done it without my players and it was the kind of thing that angered DiMaggio. Narrator: No one had a safe job on Stengel's club. One day Casey stuck a kid in centerfield, and sent DiMaggio out to play first base. Tommy Henrich: He's worried all over. He's afraid of making a dumb play because he's not familiar with first base. It would have killed him to make a stupid play. Narrator: Joe did lose his footing and ended up on the ground. And in the papers. There he was crawling around in the dirt. Not a thank you from Stengel.Not a word. The next thing Casey tried was dropping Joe out of the clean-up spot — where DiMaggio had hit since 1939. For Joe, this was shame. Jerry Coleman: There was a game in Philadelphia when he was like .2999 or .300, right at the borderline of 300. And he hit a line drive to Eddie Joost who was playing at short stop right at the tag end of the season, maybe 2 or 3 games to go, and it was caught. And he was mumbling he always talked to himself a little bit. And he said, how did I look, how did I look. And I'm thinking, why is he asking me how he looks. So, I said, Joe you look great. But I think he needed this, this confidence builder from anybody, anywhere. You know, maybe he just needed that comment to say, Joe, you look great. because of age. He reached a point where he wasn't the ballplayer in 51 that he was in 36. No contest. Narrator: Maybe he let it go a year too long. At spring training, the spotlight turned from Joe to illuminate the blond brush-cut of a country boy from Oklahoma. Mickey Mantle had everything Joe D. had fifteen years before: all the speed, the power, the fresh good looks. Here was the replacement for Joe DiMaggio. Jerry Coleman: I think that for Joe, watching this halo around his shoulders sort of slip away, realizing that he was now a mortal man and was not above all the rest of the players, I think that hurt him more than the physical part of it. Narrator: What was left for Joe once Life Magazine got a hold of a Brooklyn scouting report and printed it for five million readers? 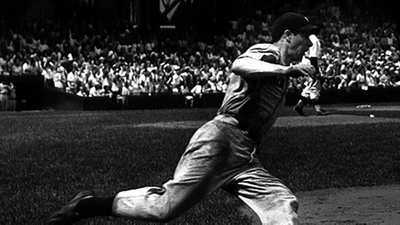 DiMaggio, it said, had only one good throw in his arm. He couldn't run anymore. Couldn't get around on the fast ball. Couldn't hit for power. And wouldn't bunt. Joe Dimaggio: You know — the frequent…I've had injuries that have been too frequent. And they certainly have been no fun. And as long as the game is not fun any longer with me I've played my last game of ball. Narrator: After the 1951 season, Joe DiMaggio turned 37 years old – and walked away from baseball as the biggest winner in history. In thirteen seasons, his Yankees won ten pennants and nine world series. Still, DiMaggio — like stars before and after — might have faded from our view. But Joe wasn't done with the hero game. Judge Torres: This is before they had a relationship? Sonny Grosso: This is before they ever knew each other. Judge Torres: Oh wow, what a coincidence. Judge Torres: On some subliminal level, you might have brought them together with your scrapbook. Sonny Grosso: Well, maybe I did. Maybe I did but — my mother used to always be looking at this scrapbook I kept and wouldn't let nobody touch it. In fact, when my mother passed away a few years ago, my sister brought the scrapbook back to me. And when the pictures got together and you could put no more pictures in it, somewhere in that area, DiMaggio and her met and later on got married. So when I first started that scrapbook, they were as far away as two people could be from being with each other. And by the end, when that scrapbook was filled, they met each other. So, like Eddie says, I may have had something to do with that. Brad Dexter, Actor-Producer: She really overflowed with a lot of sexuality, I mean physically. It was there. It was very powerful. But the sweetness of the girl and the genuineness and the refreshing quality she had became endearing to people. I mean, ah-ah-ah, truck drivers, simple workers, guys, they all fell in love with this girl. Tommy Henrich: In a sense, they were both the same way. Marilyn Monroe says, apparently this guy is the most glamorous baseball player in the world. And DiMaggio knows who she is. And maybe I could say, he felt that it was a feather in his cap. Jerry Coleman: We figured DiMaggio was in a perfect mix the greatest woman in the world and the greatest guy in the world. Joe was striking in himself and of course, Marilyn was the IT woman of the world, those days. It was a perfect match. Narrator: At the time, 1952, it did seem perfect — Joe and Marilyn, Mr. and Mrs. America — how could they go wrong? We fell in love with the idea. As did Joe, that very first night, when her publicist arranged a blind date dinner. In his silence at the table Marilyn saw solid strength. He was so different from all the Hollywood chatterers. She offered him a ride home, and asked in the car why he'd come out to meet her — surely he'd met so many famous people. Said Joe: But you're prettier than Douglas McArthur. Joe never did get home that night. Dario Lodigiani: They were great. They were laughing, you know, a lot of times, telling stories. Joe was telling stories about when we were kids, you know, what we did and all that. And she would get a big bang out of it. And I think Joe and Marilyn were, in a roundabout way, well-meant for each other. Narrator: They had one big thing in common: each was an enormous figure created by the hero machine — and inside that vast personage lived a small person fearful to be seen. In their loneliness, they might have been brother and sister. Joe insisted they be husband and wife. When they got married in January of 1954, Marilyn told reporters she was going to be a perfect wife. She'd iron his shirts and make dinner. They were going to make a room in their house for Joe Jr. And a nursery! Marilyn said she wanted six kids. Of course, she also said she wasn't giving up the movie business? Newsreel Announcer: When a well-known honeymoon couple arrives at Tokyo airport, a throng of 4,000 baseball and movie fans surge out of control, break through police lines. Joe DiMaggio and his bride smile bravely at their greeters. But they don't dare move. But their troubles aren't over. Next day comes a press conference, where the public is barred but the photographers and reporters more than made up for that. Their questions were rough, ranging from the risque to the ridiculous. And Joe, he's the forgotten man, which is something in Japan, where baseball is so popular. Ah,me, never underestimate the power of you-know-who. But enough's enough. His patience is exhausted, Joe says, Go. Maury Allen: While they were in Japan, the United States government, the Army asked Marilyn to come to Korea to entertain the troops and sing a few songs for them. And she did that. She left DiMaggio. It was their honeymoon. And he wasn't too happy about that. Narrator: Marilyn had never worked a live audience. But when those soldiers started going nuts, for the first time in her career, she said, she felt at home. And she said: "I'll always remember my honeymoon in Korea, with the 45th Division." Maury Allen: When she came back to Japan, she said to Joe she was so thrilled by the crowd and she said to Joe, there were 100,000 soldiers out there. You never heard such cheering. And Joe said, 'Yes I have.' 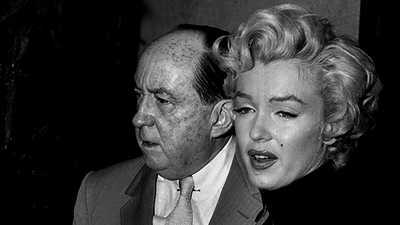 I think Joe DiMaggio never really understood Marilyn's insecurity and what she needed in her own life. Narrator: Neither could Marilyn understand Joe's fears. It wasn't long before she was back at work — long hours at the studio. Joe was home, staring at his TV, sure he was losing her. He couldn't let that happen. Brad Dexter: She told me — She says, Joe is absolutely obsessed with jealousy about me. He thinks that I've had affairs with every man that I've ever known in the industry. He doesn't trust me. He doesn't want me out of his sight. He wants me to give up my career altogether. I don't know what to do. Narrator: For the Seven Year Itch she flew cross-country to film exteriors in New York. All Joe could do was follow. Then he watched in horror as his wife made a spectacle of herself. Photographers were lying on the tar of Lexington Avenue, with their lenses pointed right up at her crotch! Marilyn and Joe had a screaming fight. And he left town. When she got back to California they fought again. This time it was physical. Next day the studio sent its minions to stage-manage her exit. Newsreel: Miss Monroe will have nothing to say this morning . . .
Narrator: She told friends Joe had beaten her, but she added: "Not without cause." She told a California court that Joe had tortured her with "mental cruelty." She wanted divorce. Joe thought he could stop her, if he could just make her see how sorry he was. Brad Dexter: I meet Frank Sinatra and Jimmy Van Heusen for dinner at the Villa Capri restaurant In walks Joe DiMaggio. Frank got me over there because he knew that Marilyn and I were good friends and perhaps I could get to Marilyn and maybe get Joe to talk to her. I called the studio. She said to me, Brad, I don't want to talk to him. I've had it — and this is it. He was. He had tears in his eyes. He was crestfallen. He had tears. And he was miserably unhappy. Narrator: The marriage had lasted two hundred seventy four days. Joe went back to San Francisco with his two suitcases, his golf clubs and his shame. And it would only get worse. Reporter: Mr. Miller and Miss Monroe yesterday you didn't know when you were going to get married. Do you know today? Narrator: In 1956, the New York playwright, Arthur Miller, announced that he would marry Marilyn. And she said Miller was the only man she'd ever truly loved. Friends told Joe he had to pick himself up, move on, forget her. Joe forgot them, instead. For the next five years, he tried to forget himself. He traveled, he drank, he dated not well, but with athletic vigor: movie stars, debutantes, beauty queens. And always voluptuous blondes: an actress who won a Marilyn look-alike contest; a Miss America whose talent was impersonating Marilyn; and a Miami Beach artiste, the Marilyn Monroe of Burlesque. The real Marilyn's marriage to Arthur Miller had broken up. She was anxious, depressed. She checked herself into a Manhattan psych-ward and now they wouldn't let her go. She was trapped, terrified — and she called Joe DiMaggio. Joe was there, next day — fierce, proprietary - as if he and Marilyn had never split up. "You release my wife," DiMaggio growled at the front desk, "or I'll take this place apart piece of wood by piece of wood." Suddenly they discovered, Miss Monroe was all ready to go. Jerry Coleman: The only time that I saw them together, outside of spring training, once, I was doing shows in New York and I was walking down Park Avenue to get to my car. And I saw this couple coming down and Joe's got his head up in the air and his arm around Marilyn. And they're just daydreaming along and never even saw me (laughs). And so, I didn't bother to stop and say hello. I thought he was happy as he was, leave him alone. Narrator: It was when they weren't together that Joe worried. The minute she went back to work; she fell in with Sinatra's posse — they knew how to have fun — and the Kennedies. Sure, Joe knew about that — more than he wanted to know. It was like he couldn't turn away. How could he save her from herself? Brad Dexter: She was a very, very unhappy girl. She felt that she had come to the end of the road, you see. And she was drinking heavily and she was also taking upper and downer drugs. She was lost. Narrator: Marilyn didn't know what she wanted. Joe helped her get a house back in Hollywood. She'd promise to stay off the booze and pills. She'd talk about getting back together — they'd have another chance. Joe talked to friends like it was all settled. They were getting married again. When Marilyn died of a drug overdose, no one came to the house but doctors and lawyers. And they didn't know what to do. So they called Joe DiMaggio. And he walled away all the Hollywood players — producers, directors, acting stars, studio chiefs. And the public. How much more did he owe them? The fame had eaten up his life. And now it took from him the one person who might have understood. The way Joe said it, they'd killed his girl. So in the chapel, safe for the moment from prying eyes, alone, embittered, Joe kissed Marilyn goodbye. Brad Dexter: Frank says: "You know, Joe hates Hollywood, and hates everybody in the picture business, and hates anybody who ad anything to do with Marilyn, or even said hello to her." But I firmly believe that all the years that he made those visitations to her gravesite and left flowers was out, he was still in love with her but also out of a great sense of guilt. Because I think he helped contribute to her demise. I'm firmly convinced that if he had behaved differently, they would have had a good marriage. He destroyed it — and he felt that guilt. Dario Lodigiani: Never mentioned her. Never. No matter what. He would never say anything about it. And we dared not say anything to him about it. You know, because that was something that wasn't easy to, I guess, to just let go. Narrator: For decades, Joe DiMaggio retreated from us. After Marilyn died, he relied on pure distance — spent a lot of time out of the country. In later years, he learned to run away without even moving. The cosmic joke was: the more he retreated, the more our hunger for him grew. If he walked away we thought less of ourselves. His blankness allowed us to make him perfect in our eyes. Sonny Grosso: He never disappointed me as a fan on the field. And he never disappointed me as a, as a fan, as a human being. Judge Torres: And, and the proof of the charisma of the man, is the incredible stature that what — put the bat down 40 years ago – the incredible stature that he still occupies in this country and perhaps all over the world. Jerry Coleman: Whether or not it was his great feats as a ball player or his being a recluse so to speak and being away from people and not sort of extolling himself to the public, or maybe Marilyn Monroe who obviously kept his celebrity going I don't know what it was. But I do know this that when you talk about a giant in our business, the business of baseball, there's nobody even close to him. 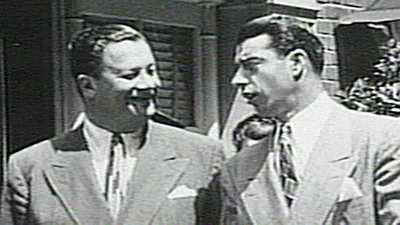 Everybody wanted to meet Joe DiMaggio, he and Ted Williams. Joe DiMaggio and Ted Williams went to see George Bush in the White House. You know, he hated signing balls and bats and stuff like that. They handed him a dozen balls to sign. He said, even the president wants balls. Narrator: DiMaggio had become an expensive commodity. After a lifetime in the hero game, no one knew better how it was played. Tommy Henrich: DiMaggio says 'You want my picture, come on and put some cash down there.' He knew his reputation and his lawyer's knew his reputation and their figure was a little bit higher, considerably higher than anybody else in baseball. Jerry Coleman: When Joe DiMaggio had an autograph session, it was probably worth a quarter of a million dollars to him for two days. Nobody else matched that. Narrator: Nobody came close. A deal to sign bats made Joe $3 million, lithographs another seven-figure deal. Jerseys, a million or two more. After a while he'd scarcely walk out his front door without being paid. But what were all the millions for? After Marilyn, Joe never remarried — never made a family of his own, only Joe Junior. But father and son barely spoke. Junior drifted in California, with drink or drugs. He would end up homeless. No, Big Joe's money was not for the boy. In the end it was mostly about him — holding on with a white-knuckled fist. When biographers approached, Joe's response was simple: Why should this guy make a buck off my life? When Paul Simon sang: Where Have You Gone, Joe DiMaggio? Joe's first instinct was to sue. He even stopped sending roses to Marilyn's grave: people were stealing his roses! Big Joe was still keeping score. Now it wasn't hits, home runs, but dollars — he still had to win every time. He was our winner, after all. What would he be if he let that go? 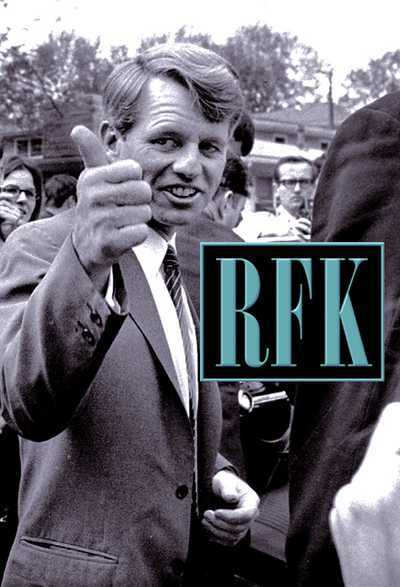 He died in March, 1999 – died as he lived: revered, extolled, subject of a frenzied commerce, in a national flood-tide of sentiment. If it was only hired help holding his hands, as he expired, if he died, in fact, cut off from all his blood relations and even his old friends; if he was hard, lonely, unhappy . . . we didn't want to know. He was our hero. Bina Spatola: It was 50 years that Joe's streak had taken place and there was a lot of publicity about these auctions that they were having and Sotheby's so I called them and I suggested, you know, I told them I had the shoes and I had the cake and a baseball and different things. And they asked me to come out, I went out there, and I showed them everything, and it was auctioned off. It was the very last thing they auctioned off. And it was quite a sensation. Everybody was hysterical at Sothebys there when they brought it up on the screen. And they authenticated it, though, with the pictures of the cake, you know, from my scrapbook. Question: How much did you get for the cake? Geta Spatola: For a piece of fifty-year-old wedding cake. Bina Spatola: And they said, we had heard, that they were going to break it up and sell it in pieces. But, they didn't. I know they sold it after that. I don't know what happened from there on. I've seen stories in the paper that it was sold. And then the next time I saw it in the paper, they said it was Marilyn Monroe's cake. And I wrote to Leland's and I told them, I said, you misquoted the cake. It's not Marilyn Monroe's cake. It's Dorothy Arnold's cake. But I never heard from them. They never answered me. Read about DiMaggio's career, his fellow ballplayers, and the national pastime that he played so gracefully. 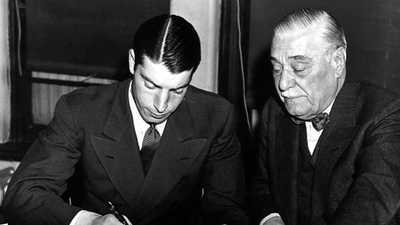 Just as DiMaggio was tough on the field, he was a hard bargainer in contract negotiations. 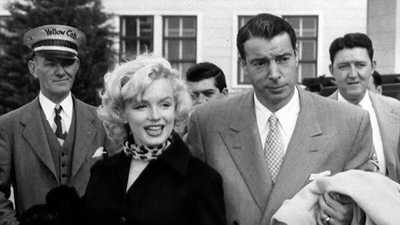 DiMaggio wanted a stay-at-home wife; Monroe wanted a husband she could talk to about her work.